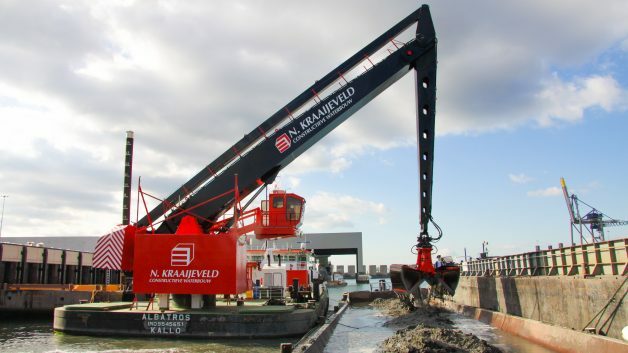 The new E-Dredger®® features the renowned E-Crane® equilibrium principe for smooth, efficient, energy saving operation in a multitude of dredging and related applications. These include sites where E-Crane® customers typically operate, such as piling, ship salvaging, heavy demolition with dynamiting, classic dyke works, construction of breakwaters, quay construction, land reclamation and beach and embankment preservation. Recently, an E-Dredger® was installed onto a self-propelled spud barge for our client Herbosch-Kiere (part of the group Eiffage) in Kallo, Belgium. The 1500B Series, model 10290 E-Dredger® has a horizontal reach of 29 meters, a lift capacity of 14 tons and a dredging depth of more than 18 metres, and will be mainly used for dock, lock and port maintenance jobs. The dredging ship ‘Albatros’ is operated by Dutch water engineering company N.Kraaijeveld B.V. (also part of group Eiffage), has started operation in the Port of Rotterdam in 2009, and will start work in the port of Zeebrugge in 2010. The biggest benefit is the low cost per ton, that offers us an economic advantage over our colleagues as well as an environmental friendlier alternative over traditional rope cranes and excavators.